Vishal Jugdeo’s work involves an investigation into the construction of images examining how meaning is built through the arrangement of things in the viewer’s field of vision. Recent sculptural installations have made reference to concepts of theatre and the stage, exploring, for instance, how the tableau works to articulate narrative and meaning. Such formal issues of colour, pictorialism and composition have often been a part of the work, proposing a relationship between painting and the set: two spaces that may be seens as interlinked by their similar dependence on an active or believing viewer. For the Western Front, Jugdeo is presenting a set of work that extends on his previous artistic practice, articulating further certain themes that have appeared and reappeared in his work: the psychological relationship of subjects to architectural space (particularly the domestic), the uncanny ambiguity between real and the imagined situations, the conventions of film and notions of the mise-en-scene. The exhibition will feature a new video work that casts an image of the artist’s body as both self and performed or constructed identity. Vishal Jugdeo received a BFA from Simon Fraser University in 2003 and a MFA from the University of California Los Angeles in 2007. 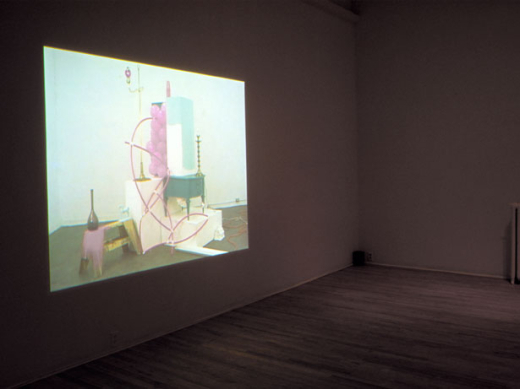 His work has been exhibited in Canada and the United States, including a solo show at the Western Front, and group shows at the Belkin Satellite, Vancouver, BC, the Armory Center for the Arts, Pasadena, CA, Elizabeth Dee Gallery, New York, NY and Leslie Tonkonow Artworks and Projects, New York, NY. He will present a solo exhibition at LAXART in Los Angeles in May 2008.